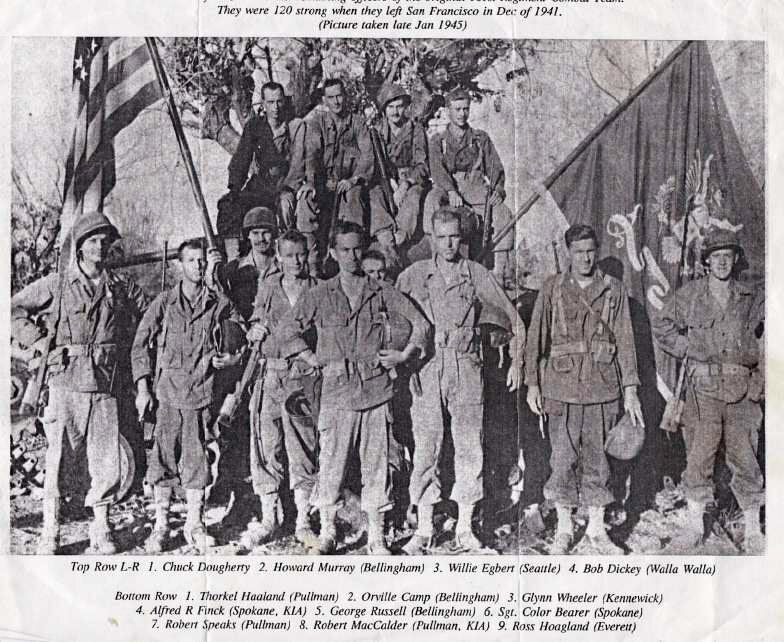 The Washington National Guard’s 161st Infantry Regiment fought throughout WWII in the Pacific, seeing action in Guadalcanal from December 1942 , then on New Georgia in the northern Solomon Islands from July 1943. Following the campaign for new Georgia in Nov. 1943, the regiment spent much of 1944 in New Zealand and New Caldeonia, being brought back to full strength and training for landings in the Philippines. The return to Luzon was also a return by the regiment after a 46-year absence, of the 1st Washington Volunteer Infantry, now the 161st Infantry, not to fight the Filipinos as their grandfathers had done but to liberate them . The unit landed on Luzon in the Philippines in January 1945 and participated in the battle for that island into July, of that year. They were training for the invasion of the Japanese home islands when the atomic bombs were dropped but instead entered Japan peacefully and shortly thereafter returned home to Washington and were inactivated. The 1st Batallion of the 161st was again called to active duty in 2003 and in 2008 for service in Iraq. The battalion provided security for the Green Zone and conducted full spectrum operations in southeast Baghdad. There the 161st faced stiff opposition from the Mahdi Army, led by Shiite Cleric Al Sadr.